This chapter focuses on three key areas relating to adaptation and resettlement: education, employment and support. 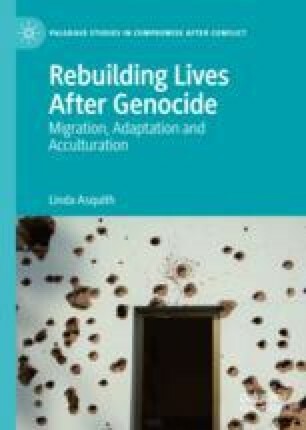 In explaining their relevance to genocide survivors, a Bourdieuian perspective is again utilised in order to examine the hidden aspects of structural adaptation. The chapter begins with a discussion of how survivors use their social capital to aid their resettlement and reintegration, focusing on how they access education and employment. There is a marked difference between Holocaust survivors and survivors from more recent genocides in terms of how they access work, and this has a significant influence on how survivors develop social capital. Finally, there is a consideration of support for survivors, and how that support is accessed, and the appropriateness of support. Anderson, B., & Rogaly, B. (2005). Forced Labour and Migration to the UK, London. Retrieved December 22, 2018, from http://ituc-csi.org/IMG/pdf/Forced_labour_in_UK_12-2009.pdf. Black, R., Collyer, M., Skeldon, R., & Waddington, C. (2005). A Survey of the Illegally Resident Population in Detention in the UK; Home Office Online Report 20/05 London, Home Office. Retrieved January 2, 2019, from https://www.researchgate.net/profile/Michael_Collyer/publication/265115805_A_survey_of_the_illegally_resident_population_in_detention_in_the_UK/links/5458b9d30cf2cf51648351d2/A-survey-of-the-illegally-resident-population-in-detention-in-the-UK.pdf.